Tip the flours into a large mixing bowl and on one side of the bowl put the salt and the other the yeast. Add the butter and three quarters of the ale and just start to bring the ingredients together gentle with your finger tips. Add the ale drop at a time until you the flour is clean from the inside of the bowl and you have formed a rough dough (you may not need all the ale, or you may need a little but more – the dough should be soft but not soggy). Tip the dough onto a lightly floured surface and fold it into itself repeatedly, until the air is knocked out and the dough is smooth. Divide the dough into 14 equal pieces and roll into balls with your hands. On each tray, place a ball in the centre and then arrange the rest of the balls around it so they are almost touching. You will want 7 balls on each tray. Put each tray in a clean plastic bag and leave again for at least an hour, until the dough is at least double in size. 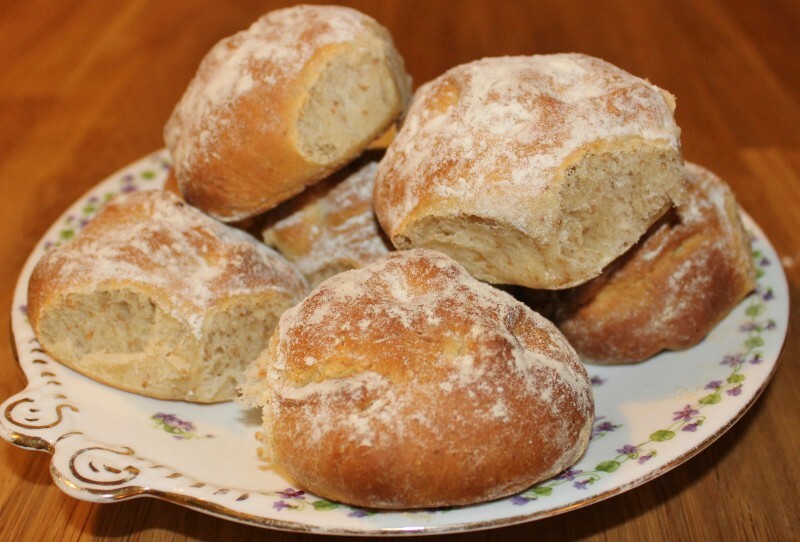 Dust each roll with flour and bake in the oven for 30 minutes, until the rolls are golden brown and smelling gorgeous. Leave to cool on a wire rack slightly before serving. Awesome! – You’ll have to let me know how you get on….